Well, you guys called it! I covered up the name of the school for privacy reasons. 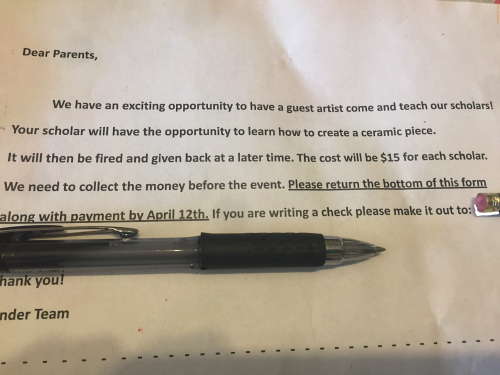 They want $15 per scholar (we have twins, so $30 for both) to participate in a special ceramic art thing. My mom has taken the girls to a ceramics store in the past and I recall it being crazy pricey (going off memory – and I’m not the one who paid – but I want to say it was close to $40-50 each). So I know that $15/student really isn’t a bad deal. But, of course, it’s something we didn’t budget or plan for and both kids are BEGGING to be included in the art activity. So….we’ll end up paying the $30 and letting them participate. Sigh. Hopefully we’ll save enough on our food budget that this unplanned $30 expense won’t be a big deal. If your kids have a “special” activity at school that costs extra money, do you let them participate? Would you set a limit on how much you’d spend?